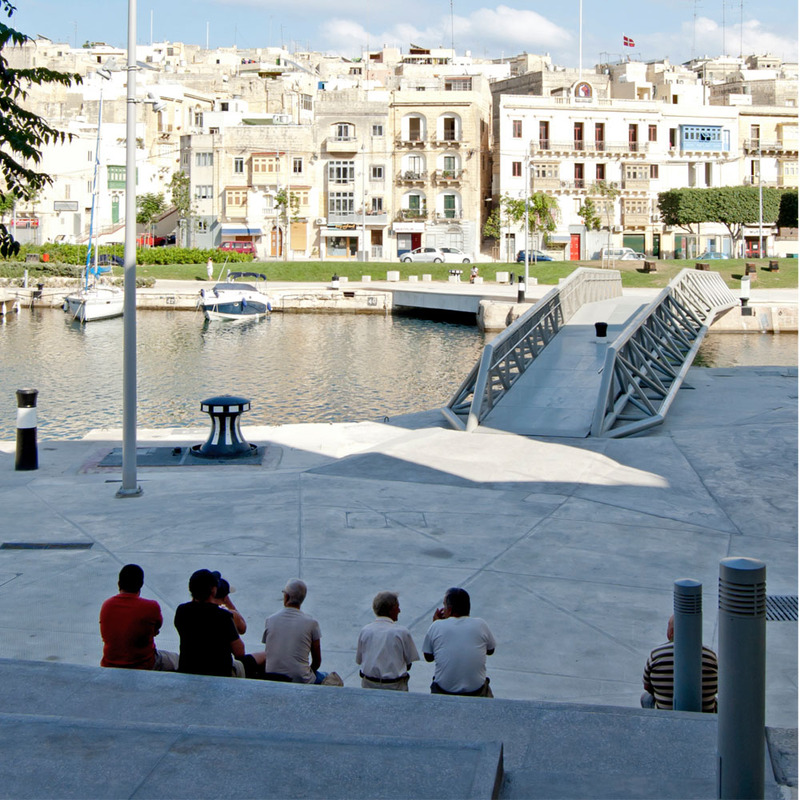 The Cottonera Regeneration Project, proposed by the Government of Malta and aided by funds from the European Union, aims at improving the Three Cities area and its waterfront, with Dock 1 to be considered a critical nodal-link in achieving the sustainable regeneration of the whole area. 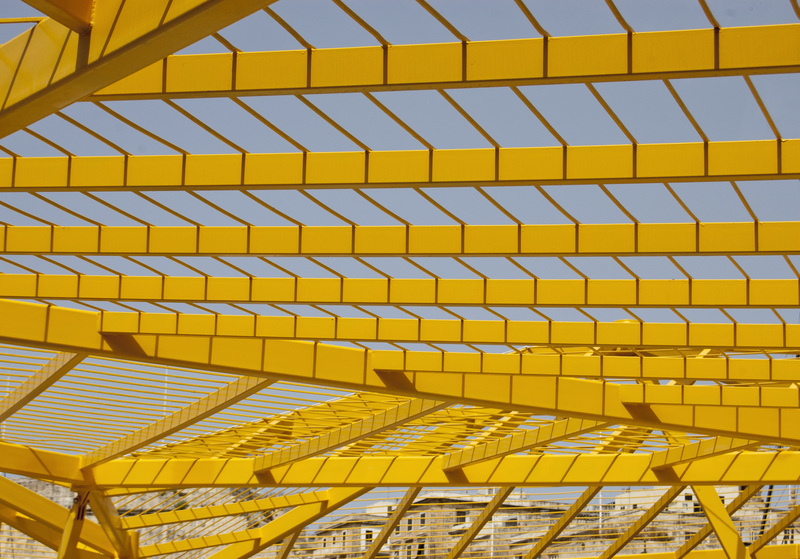 In 2008 the Government of Malta adopted the landscaping phase of AP Valletta masterplan for the area. 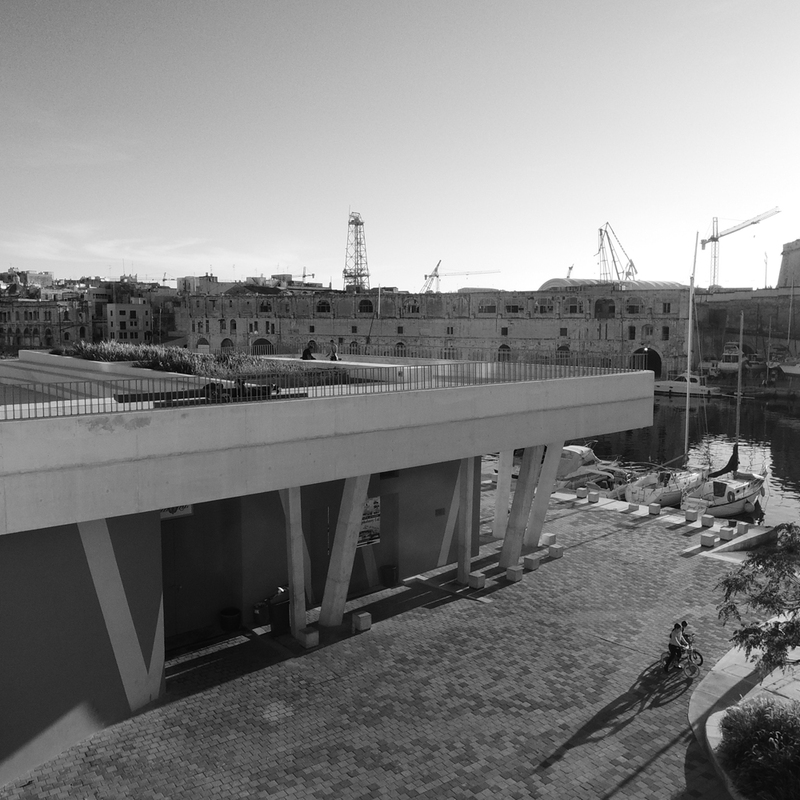 Until the landscaping project was implemented, the waterfront was walled off to the public – the big closed red gate at Misraħ Gavino Gulia marked the disuse of the dock. For any regeneration to commence, both physically and socially, the removal of barriers to the waterfront was of the utmost importance. 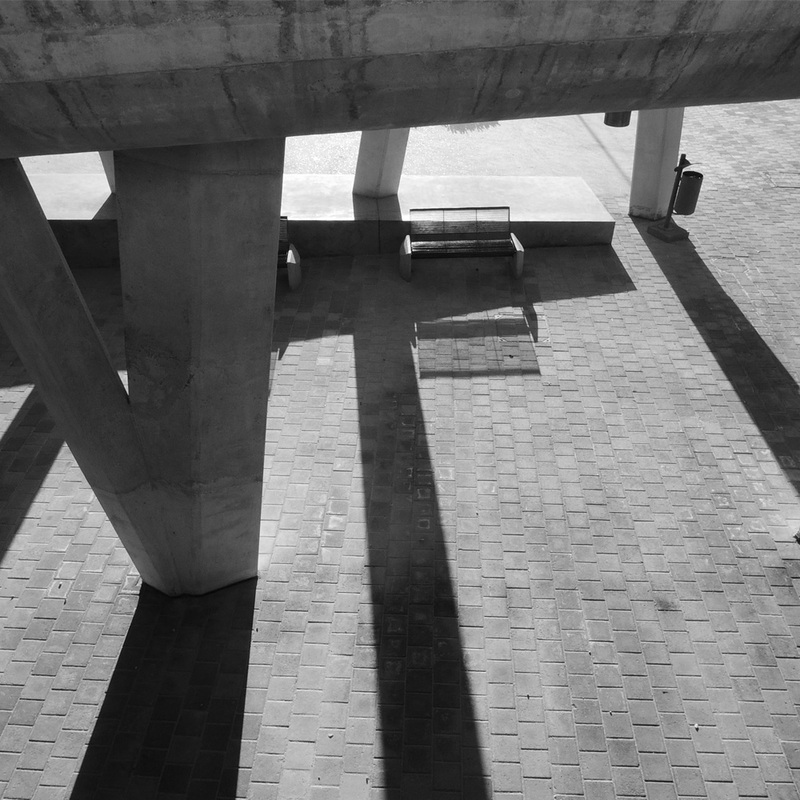 This social emphasis of urban regeneration is at the core of the landscaping project. 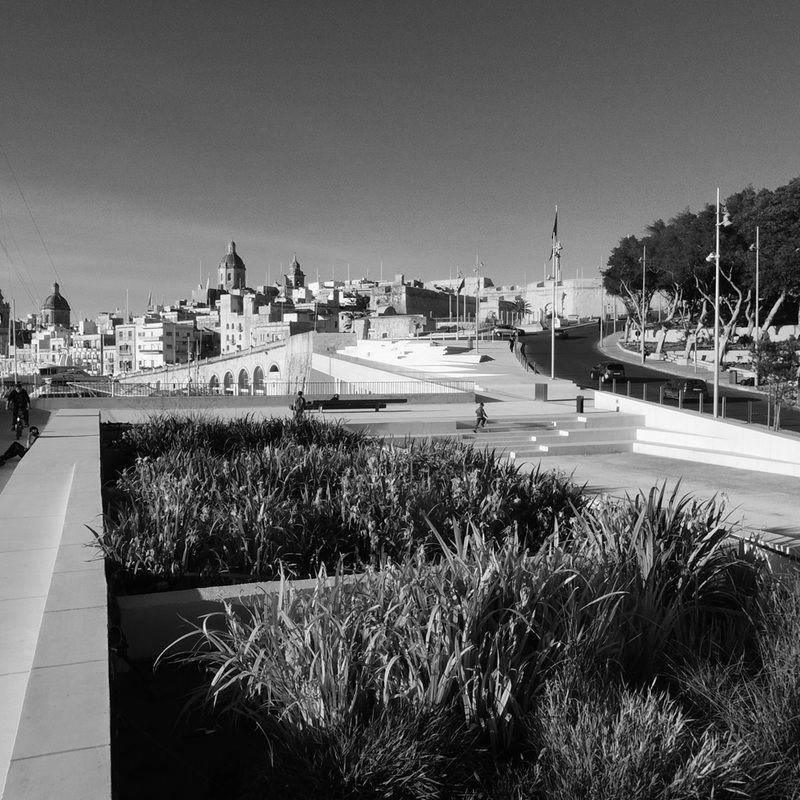 The Creek once again unites, rather than divides the residential quarters of the Three Cities, through a continuous 2.5km long promenade, linking Senglea’s and Vittoriosa’s waterfronts with gardens and public spaces, retaining the industrial heritage of the dockyard. The landscaping of the waterfront and public spaces around it can be viewed as a series of nodes (space of urban-gravitas). Misraħ Gavino Gulia, retained as an open piazza, with the removal of the gate and wall, it now extends to the water’s edge. Its landside perimeter is lined with shops and bars, turning the space into an established town-centre and gateway for visitors and locals to access either side of the waterfront. 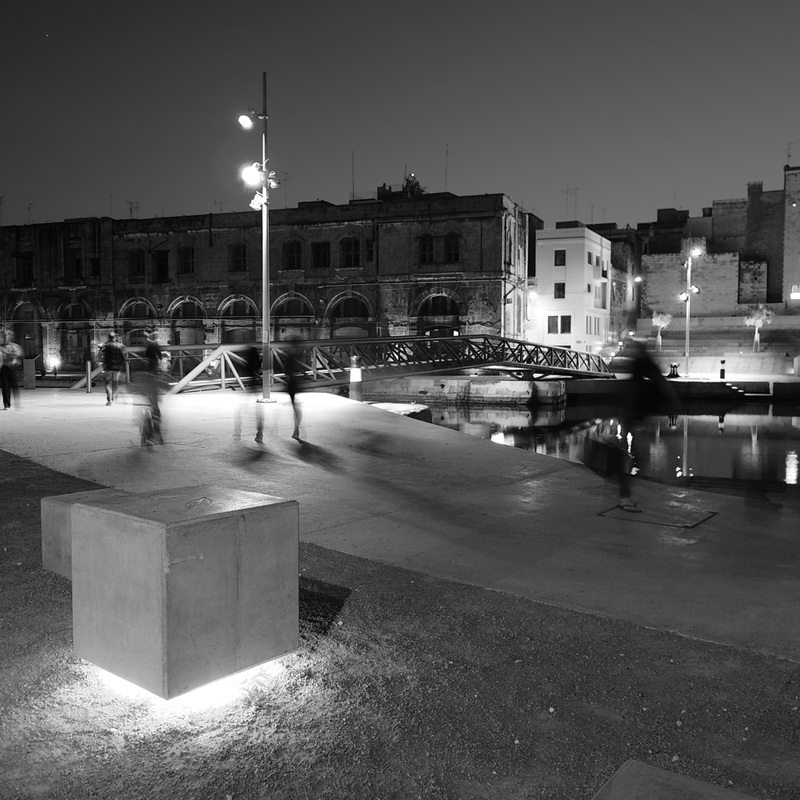 Each node is linked through the waterfront and street level promenade; a series of lawned dunes, rising and disappearing into laid paths, creating tiny pockets of public yet personal spaces, with the use of designed public-furniture; steel strapped wooden beam benches; concrete cubed seating and tables; all elements recalling the dockyard’s long industrial identity. 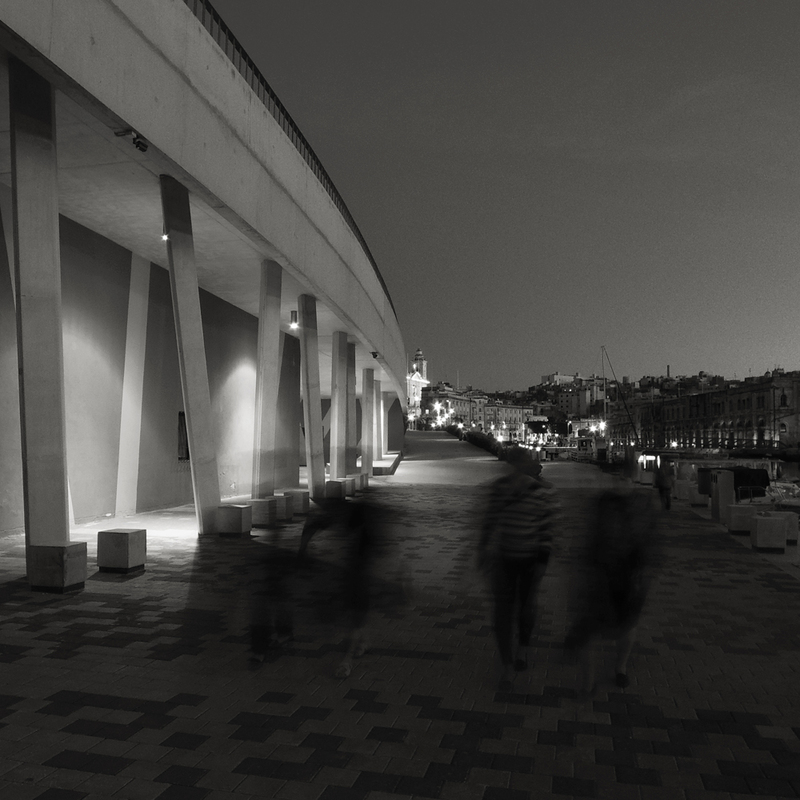 Triq ix-Xatt ta’ Bormla runs the path to the Cospicua waterfront and Piazza Paolino Vassallo. 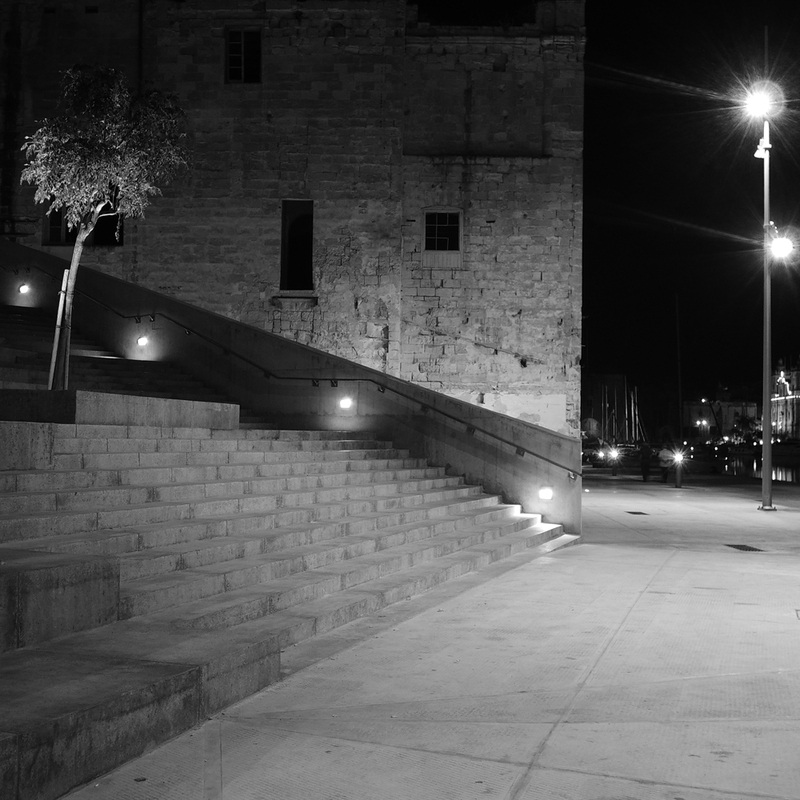 Unlike the more traditional function of Misraħ Gavino Gulia, this plaza with the old Rialto Cinema, Socjeta’ Filarmonika San Ġorġ (band/social-club), and other bars, is an opportune space to host social and cultural events, becoming one of Malta’s prime public cultural spaces, appealing to the locals as well as other cultural visitors. 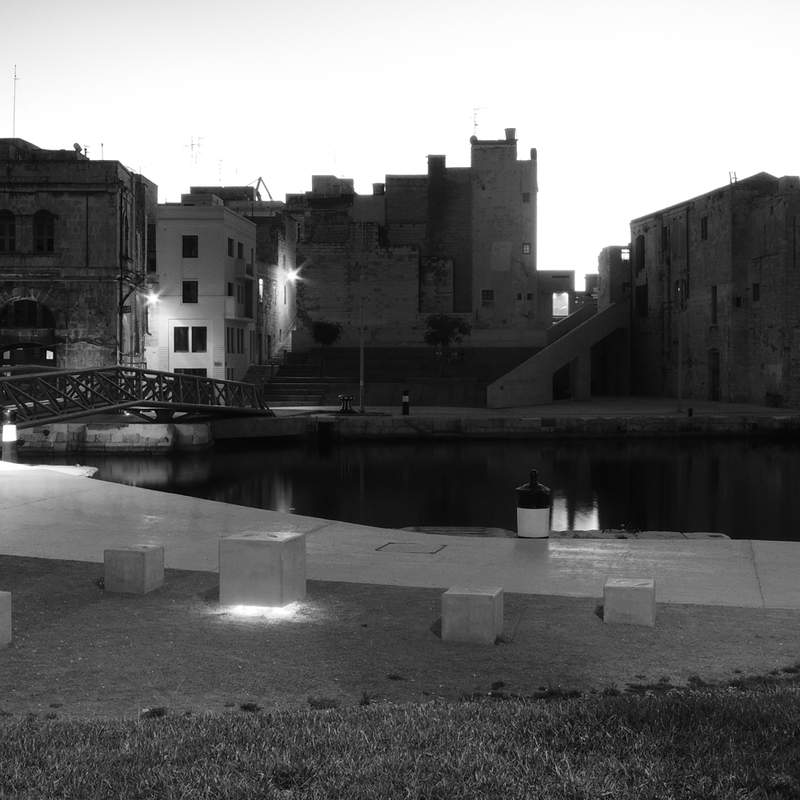 From here you could go either of three ways; across the new connecting bridge, spanning 45m over the creek into Senglea, entering a stepped plaza, which again is set to be activated as an open cultural space (the Senglea side is part of another phase of the encompassing regeneration plan); continue through the dunes along the Cospicua waterfront; or ascend, past the Phytoremediation Tanks (see below), towards the belvedere, from where you obtain uninterrupted views of Dock 1, facing Senglea. Below the belvedere is storage space for the local maritime activity, and by the water’s edge a landing platform and waiting area for the various ferries servicing the area. 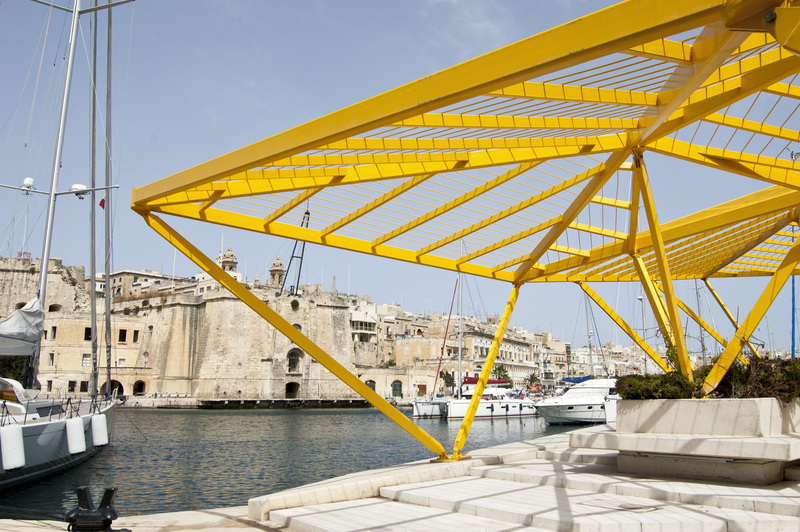 Further along the waterfront, a yellow steel framed pavilion with planters at its base creates a natural creeper-canopy over diners. 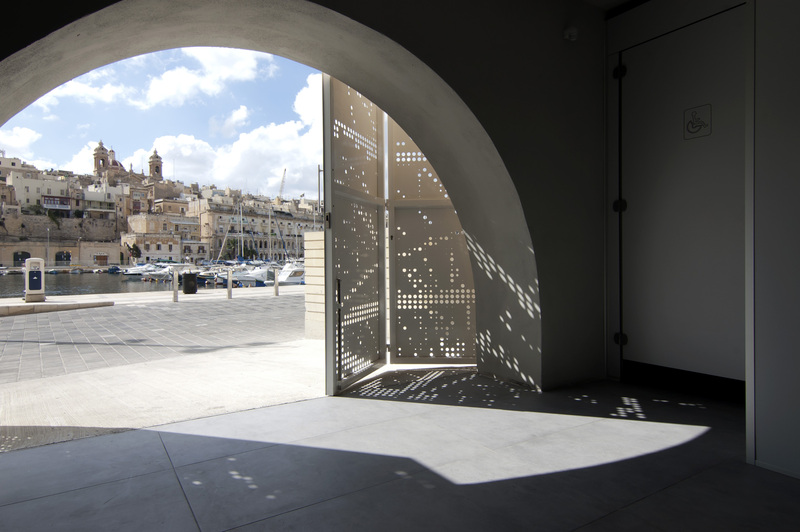 The promenade continues towards the Birgu Waterfront, via Xatt ir-Risq, past Vault no.0 and a new public convenience, arriving at the Freedom Monument and the steps of the Church of St. Lawrence. Vault no.0 houses NEPTUME, which forms part of the sustainable side of the landscaping project. NEPTUME (No-Discharge Energy-Efficient Prototype for the Treatment of Urban Municipal Effluent) is a research project done in collaboration between AP, the Biology Department at the University of Malta, Argotti Botanical Gardens and the Water Services Corporation (WSC). A wastewater treatment plant, it purifies municipal waste from local sources. This filtered wastewater is now fit for use as irrigation for the surrounding vegetation and landscape. The other supply for irrigation comes from the reconditioned historic water reservoirs from the Knights’ and British periods. Another sustainable consideration was the lighting of the open spaces – the energy consumption of the LED lighting for the entire 33,000 sq m site is equivalent to that of no more than a few households. The Dock 1 landscaping project has been in the making for a long time. Through dialogue with the local councils, local businesses, traders and NGOs, the project reads, as it should, as a reactive design, sensitive to the needs of a community and place, that for decades has suffered a decline in prosperity.